Qsilica Skin Regeneration BEAUTY SLEEP Night Cream has won the Night Cream category at the coveted 10th Annual Nature & Health Natural Beauty Awards, announced today by editor Pamela Allardice. It’s the second time Qsilica has been honoured at the Awards. Last year Qsilica REMOVE Make-Up Grime and Cleansing Gel won the Best Cleanser category. The Australian-made brand has now won eight natural beauty awards at home and in the United Kingdom since 2012. The Nature & Health Natural Beauty Awards are known and respected as the definitive buyer’s guide of the best natural beauty products available. Formulated with the brand’s hero ingredient silica as well as natural oils and antioxidants, Qsilica Skin Reneration BEAUTY SLEEP Night Cream fulfiled the Awards’ specific criteria, which states products must be free from parabens, phthalates, ammonia, resorcinol, sulphates, artificial colours and fragrances and animal testing of any kind. “We’re thrilled for one of our products to be chosen again as a Nature & Health Beauty Awards recipient—it’s confirmation that the love, naturopathic knowledge and scientific understanding we’re putting into Qsilica is shining through,” says Qsilica Brand and Marketing Manager, Christine Guy. 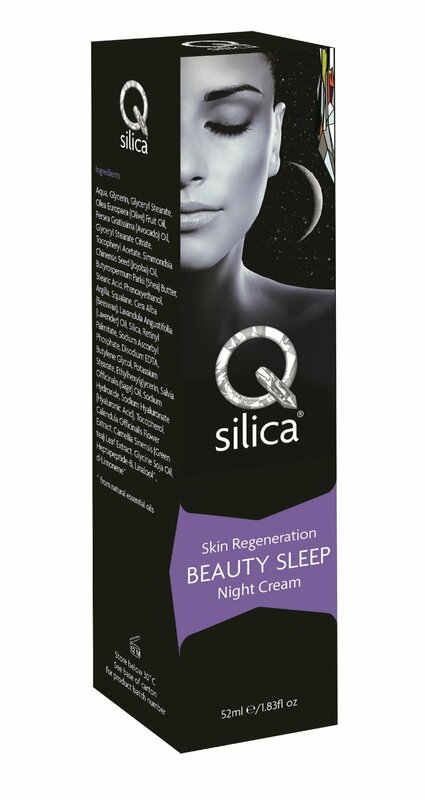 Qsilica Skin Regeneration BEAUTY SLEEP Night Cream works with the body’s natural cycle of cellular regeneration. Scientific research shows the majority of cell repair happens during REM sleep, with proliferation of skin cells said to be at their peak at midnight. Scientifically formulated with key nutrient colloidal silica to support skin health, the award-winning night cream also boasts antioxidants such as green tea and Vitamin E to help repair daily damage. Natural oils such as jojoba, olive, avocado, calendula, sage, lavender and shea butter soothe and moisturise skin and calm the mind as you drift off to sleep. The award-winning cream also contains scientifically tested actives such as Hyaluronic Acid and Heptapeptide 8, which work to enhance the skin’s cellular regeneration process. Also try Qsilica Skin Regeneration BEAUTY SLEEP vegetarian tablets with tart cherry, $24.95 RRP, to help improve your sleep quality and enhance skin regeneration during the night, assisting the body’s antioxidant defences to help fight the signs of premature ageing.